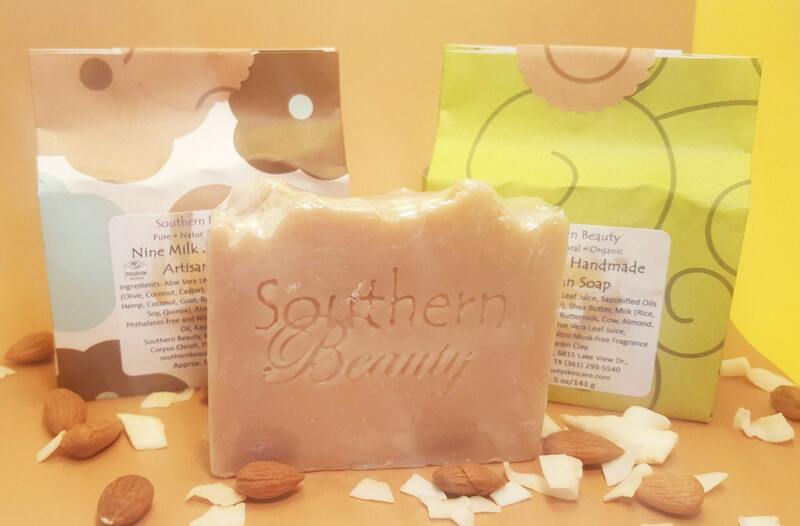 I formulated this soap with nine different milks to be soothing to the skin. There is rice, hemp, coconut, goat, cow yogurt, almond, buttermilk, soy and quinoa milk. I make this soap in small batches in my studio. There is no coloring added to this soap. You can rest assured that only the very best ingredients with beneficial properties have been used in this soap. This soap is a customer favorite. This review is based on looks and speedy delivery. It is a gift so I have no way to evaluate the final bath product. It is much larger than expected, but it's gorgeous. The package arrived quickly, and it was well wrapped so none of the bathbombs were chipped. This is an adorable bath bomb Christmas tree, and I hope it spins because I'm sending it to a five year old for a post-Easter gift (yes, she and I do quirky things for each other, she'll laugh and tell me I'm a silly aunt, and I'll get teary eyed). This review is based on looks and speedy delivery. It is a gift so I have no way to evaluate the final bath product. It is much larger than expected, but it's gorgeous. The package arrived quickly, and it was well wrapped so none of the bathbombs were chipped. The skull is gorgeous and white and glittery. It's a work of art. This review is based on looks and speedy delivery. It is a gift so I have no way to evaluate the final bath product. It is much larger than expected, but it's gorgeous. The package arrived quickly, and it was well wrapped so none of the bathbombs were chipped. If payment is not received within 48 hours, the item will be relisted. Sales taxes are added for Texas customers only. Cancellations must be done immediately as we pack and ship as quickly as possible, often the day we receive your order. If your product is damaged or you are unsatisfied with your product, you must let us know within 1 week of receiving your product and we will offer a shop credit or exchange. You will be required to pay return shipping. We will ask for a picture of the damaged item to better serve our customers in the future. Once your package is scanned by USPS, Southern Beauty is no longer responsible to assure your item arrives to the address you requested. Please see our shop policies regarding theft, loss etc. Products will be shipped within 1 -3 business days via USPS, unless otherwise stated. Please allow 3 - 10 days for delivery. **We are not responsible for any hold-ups due to customs on international orders** Also, we use tracking on all shipments. Once your package is scanned and is in the hands of USPS, we are no longer responsible for your order. If you do not receive your order and/or it was stolen and we have tracking that it was delivered to the address provided, we are no longer responsible and we cannot issue a refund or free replacement for your loss. You will need to make a claim to USPS, file a police report and file a claim with your credit card company or home owner's insurance, if applicable. Note: I make my products in small batches and always aim to use the finest, high-quality natural and organic ingredients. My products are not tested on animals and are cruelty-free. If you have any suggestions, comments or suggestions on my products, please email me. Disclaimer: The statements regarding these products have not been evaluated by the US Food and Drug Administration (FDA). Southern Beauty products are not intended to diagnose, treat, cure, or prevent any disease. It is the consumers responsibility to be educated on the use of any ingredients used in Southern Beauty Skin Care products. If pregnant, nursing or suffering from any medical condition, consult a health care practitioner before use. If you have any questions, contact the shop owner.